The tension has been mounting for months. And on finally taking his own turn to speak earlier today, at least in the eyes of some, the Pope punted. 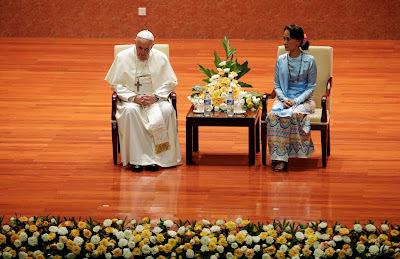 With Myanmar increasingly in the crosshairs of the international community over the country's perceived aggression toward the persecuted Muslim minority known as the Rohingya, the run-up to this first-ever papal visit there has been dominated by whether or not Francis would seek to confront his hosts by using the group's name for itself, which is "taboo" among the Buddhist majority. Yet in his late-afternoon speech to the leaders of the onetime Burma, the pontiff ostensibly heeded the pressure from his own diplomats and the country's first-ever cardinal, avoiding the thicket head-on while calling nonetheless for "respect for the dignity and rights of each member of society, respect for each ethnic group and its identity, respect for the rule of law, and respect for a democratic order that enables each individual and every group – none excluded – to offer its legitimate contribution to the common good." Of course, this was just the end of the first day of a weeklong trek – one whose final leg, in heavily-Muslim Bangladesh, will head to the place to which tens of thousands of Rohingya have fled. 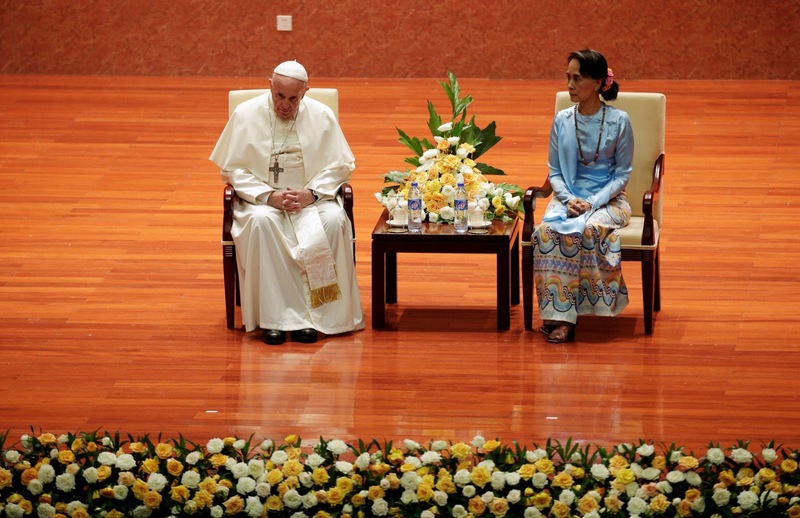 Still, today's address to Myanmar's ruling elite was arguably the principal indicator of the degree to which Francis was willing to push the issue, above all given the presence of the Nobel Peace laureate Aung San Suu Kyi, whose global fame as a champion of human rights has been tarnished by her silence on the military-led campaign against her own country's religious minority, who are viewed by the authorities as "illegal immigrants." Now holding the posts of "State Counselor" and Foreign Minister after last year's limited return to democratic rule, Suu Kyi – who remains constitutionally barred from Myanmar's presidency due to a provision inserted by the country's prior military regime to keep her from the role – met for nearly an hour with the Pope today, then going on to host Francis' encounter with the civil authorities (seen at top). Further underscoring her standing as the nation's supreme figure in fact if not title, Papa Bergoglio's time with the official head of state, President Htin Kyaw, ran considerably shorter and was designated as a mere "courtesy visit." After Suu Kyi's private audience with Francis in the Vatican last May, Myanmar became the latest country to establish full diplomatic relations with the Holy See, having been one of the last few holdouts. Notably, the contretemps over the Rohingya – who the Pope last referred to by name in August while pleading for their "full rights" – has overshadowed the stark poverty he will find on both stages of this visit. As the front page of yesterday's L'Osservatore Romano sought to highlight, roughly a third of Myanmar's population of 53 million lives in "absolute indigence." While Catholics comprise only some 700,000 Myanmarese, the country now has a cardinal in the Salesian Charles Maung Bo, 69 (above right) – the archbishop of its largest city, Yangon, who Francis elevated to the scarlet in 2015. A lead public voice against the pontiff's explicit use of the term "Rohingya" ahead of this week's trip – and long seen in Roman circles as a decidedly influential figure across the growing Asian church – it bears recalling that Bo's entrance into the papal "Senate" had been anticipated at the Vatican well before the current pontificate, extending as far back as 2010. Before departing for the Bangladeshi capital, Dhaka, on Thursday afternoon local time, the Pope will celebrate two Masses (including one strictly for young people) and hold formal meetings with Myanmar's bishops and its leading Buddhist monks. Albeit not on the Pope's public schedule in Bangladesh, a meeting with Rohingya who've left Myanmar has been hinted at by Cardinal Oswald Gracias of Bombay, one of Francis's "Gang of Nine" advisers, its exact timing unknown. In a rarity for any papal road trip, meanwhile, Francis will perform priestly ordinations on Friday morning at a Dhaka park. 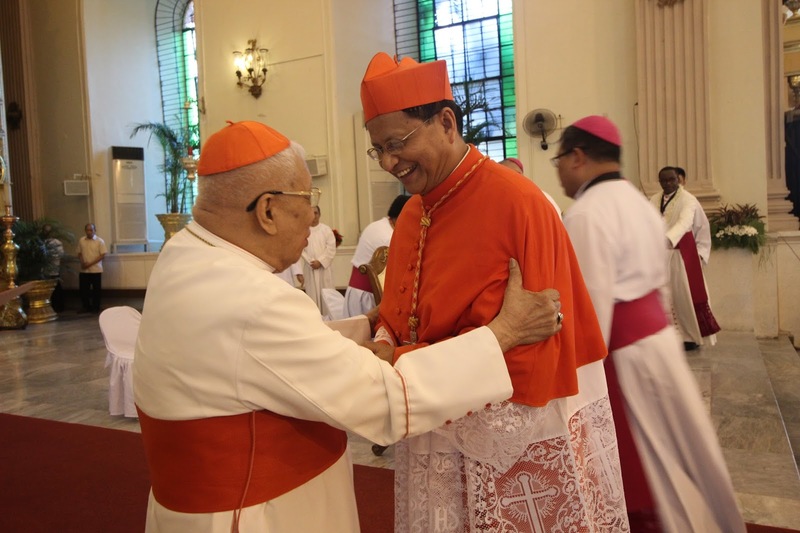 Like Myanmar, the pontiff's next stop has its own first red hat given by Francis: Dhaka's Patrick D'Rozario, 74, the first member of the Congregation of Holy Cross to become a cardinal in some six decades.